First there were widespread dealership closings by General Motors Co. and Chrysler Group LLC as part of their post-bankruptcy reorganization plans. Then there were dealership-auto maker arbitration hearings ordered by the U.S. Congress after many dealers complained about the shutdowns. Now come post-arbitration lawsuits by dealers in federal and state courts. They mainly target Chrysler, but one class-action suit is going after the U.S. government for allegedly spurring the dealership closings. In rural Atoka, OK, co-owners Jack Haigh and Bob Sullins of Crossroads Superstore are suing Chrysler as part of a mass-action lawsuit. Crossroads, which had sold both GM and Chrysler products, joins forces with three other dealers. They are: Mark Calisi of Eagle Auto Mall Corp. in Riverhead, NY; Charlie Morris of Terry Chrysler-Jeep, of Burnt Hills, NY; and Jim Bickford of Westminster Dodge, Dorchester, MA. They are among the few Chrysler dealers that won arbitration rulings against the auto maker that prevailed in 108 of 140 cases. Its a hollow victory, lead attorney Leonard Bellavia of New York says of Chrysler dealers arbitration wins. Dealers who prevailed still must improve their facilities at Chryslers behest, win back customers or spend even more money in litigation, he notes. After their arbitration wins, several dealerships such as Crossroads received unreasonable and unconscionable letters of intent (LOIs) that prevent their ability to resume business operations, according to their legal filings. I do not know of one dealer who won arbitration or that was offered reinstatement who is back to selling new vehicles with Chrysler, says Crossroads Haigh. Haigh and his co-plaintiffs seek reinstatement, compensation for lost income and damages. The Crossroads owners say they joined the East Coast suit because they wanted to leverage costs and thought a federal court in New York. The case will be heard in New York Eastern District Court in Long Island. But it might not stay there. Chrysler is making a motion to transfer the case to Michigan to consolidate it with the case it has brought against several Michigan dealers, Bellavia says. Haigh is disappointed because he thinks he might have done better with Chevrolet store negotiations, but instead opted to settle a wind-down agreement with GM. At the time, he says Chrysler representatives were telling him it would help Crossroads chances if it werent dualed with GM. Haigh now says settling with GM was a rash decision and the dealership could have been better off with GM, even though Chrysler truck sales typically outperform Chevrolet in his market. Chrysler told us it would be far better for us not to have the GM dealership in order to better serve Chrysler. So we put all our eggs in the basket with Chrysler, says Haigh. 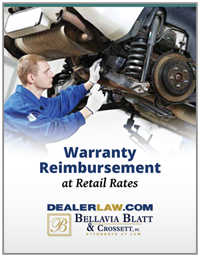 By September, about nine dealers nationally sued Chrysler in state and federal courts. Chrysler wont confirm the number of lawsuits. One attorney estimates Chrysler could be spending at least $1 million a month in legal fees. It would be inappropriate to discuss matters now in litigation, Chrysler spokesman Mike Palese says in a statement. He reiterates Chryslers ongoing claim that dealers selected for termination were carefully considered, taking into account its Genesis plan of consolidating brands at a single sales point. Placing all four brands under one roof in modern facilities has already resulted in enhanced profitability for the Genesis dealerships, he says. It is well documented that due to Chryslers optimized network, existing dealers are already enjoying increased profitability and are making significant investments in their dealerships, Palese says. The federal suit in New York could take more than a year, Bellavia estimates. Chrysler will be represented by WilmerHale, a Boston firm. Gilbert Dannehower, owner of Deland Dodge in central Florida, was the first dealer to win in arbitration against Chrysler. Still, hes pressing his case forward and suing to get Chrysler to comply with the arbitrators award. He couldnt accept the steep investment in facilities required by the LOI, says his attorney, Mark Ornstein. The lawyer says it is unreasonable to expect a dealer, financially strapped after being shut down for a year, to come up with $1 million for facility improvements. Dannehower also refused to sign the Chrysler LOI after winning in arbitration because he was put off by the language allowing Chrysler to deny him merely if other Chrysler dealers object to what he considers his arbitrated right to sell vehicles. The arbitrator, a retired judge, went out of her way to mention it in her award, he notes. The dealer terminations were 20,000-ft. decisions made in the heat of bankruptcy, Ornstein says. Congress, when giving the dealers a right to arbitrate, allowed dealers to tell their individual stories. Why isnt GM facing the same LOI legal challenges as Chrysler? Dealers battling to get their dealerships back are the fighters that Chrysler needs to better its retail network, Haigh says. Meanwhile, several dealers filed a federal class-action suit against the U.S., claiming the federal government forced Chrysler and GM to terminate the franchises of thousands of auto dealers, lawyers for the dealers say. Colonial Motors, a former GM dealer in Mississippi, and Finnin Motors, a former Chrysler dealer in Iowa, filed suit on behalf of a nationwide class of more than a 1,000 dealers, saying unnecessary government economic regulation caused the dealer-franchise terminations. They are seeking to be fully paid for property damages, says Dallas attorney Richard Faulkner. Without need and, on a theory, the federal government demanded that GM and Chrysler immediately terminate a huge number of car dealers or be denied obtaining billions of dollars of TARP (Troubled Asset Relief Program) money, Faulkner says. A subsequent government report by the Special Inspector General for the Troubled Asset Relief Program indicated the widespread dealership closings were not vital to the two auto makers survival and unnecessarily resulted in thousands of nationwide job losses in the depth of the recession.